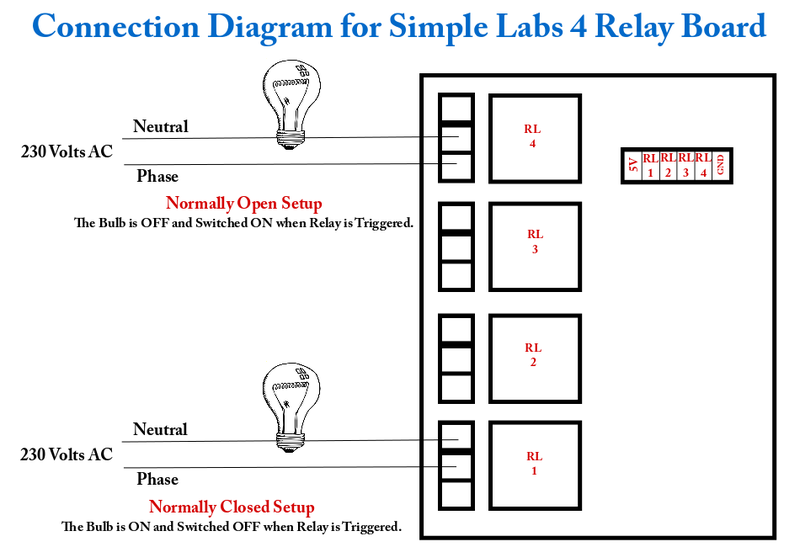 Simple Labs 4 Relay Board - New! The current from the I/O Pins of our Induino R3 is not sufficient to drive a relay. Hence we will be required to use a transistor to control a relay. The ULN2003 is Darlington Transistor Array that consists of 7 Darlington Pairs of transistors. Each pair can drive 1 output requiring higher drive current [in our case relays]. A 5-pin / 6-Pin connector is provided to connect the relay control board to connect it to a microcontroller board. The pin description is as follows. Three 2-pin screw terminals, one for each relay is provided in the normally open mode, which means by default, there is no conductivity between the two pins of the screw terminals. The relay control pins are given as input to ULN2003. The Darlington paired transistors inside the ULN2003 provide enough current amplification to drive the coil in the relay. The coil in the relay when activated will in turn trigger a switch which will internally close the connections between the two terminals of the screw terminals. Connect one of the relay control pins (RL1/RL2/RL3/RL4) of the 5-pin / 6-pin connector to any digital output pins of a micro-controller. Turning on the relay control pin will turn on the respective relay hence turning on the load. for(int counter1=0;counter1<12 data-blogger-escaped-12="" data-blogger-escaped-a="" data-blogger-escaped-as="" data-blogger-escaped-be="" data-blogger-escaped-bits="" data-blogger-escaped-counter1="" data-blogger-escaped-if="" data-blogger-escaped-in="" data-blogger-escaped-inverse="" data-blogger-escaped-is="" data-blogger-escaped-loop="" data-blogger-escaped-msb="" data-blogger-escaped-next="" data-blogger-escaped-order="" data-blogger-escaped-pulsein="" data-blogger-escaped-receive="" data-blogger-escaped-receiving="" data-blogger-escaped-the="" data-blogger-escaped-to="" data-blogger-escaped-we="" data-blogger-escaped-will="">1000) // checking the duration of each pulse, if it is a '1' then we use it in our binary to decimal conversion, '0's can be ignored. 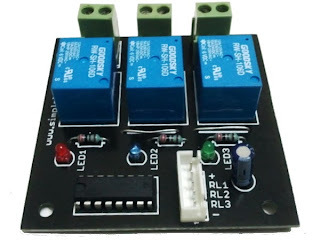 In the same way as you would connect a single relay... ensure you have a proper 5V power supply..
How much wattage can they handle,.. Say if i want to control toaster, or AC,. Will they able to withstand or will they burn away. Not advisable for A/C's... Toasters, depending upon the toaster should be ok... check ratings on the relay and work @ 70% of the given ratings for best results. how do i control the switches on the wall? and exactly how much load exactly can the relay board take? Well this requires some tricky wiring and a relay with both NC & NO states. The process is going to be similar to wiring a two-way switch. I got the the four channel relay from simple labs and its has a 3 pin pheonix connector, but this tutorial has a relay with only two pins. Can u plz tell me the difference? I am getting lots of errors which are not declared. like - pulsein was not declared in this scope.